“There is an air of something very classic and French yet the mentality is rock and roll, which speaks to me.” says Erin Wasson of French label, Zadig & Voltaire in this week’s Editors Picks on Net-A-Porter. 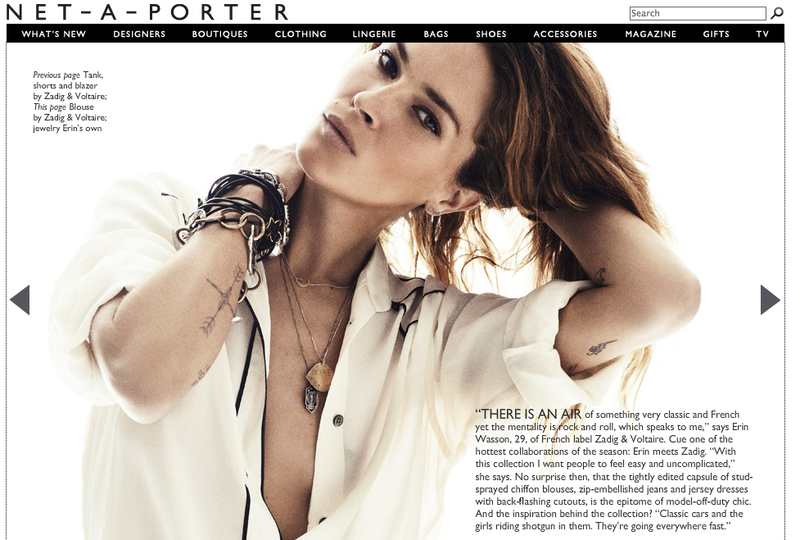 Make sure you check out the superbly relaxed Erin Wasson for Zadig & Voltaire capsule collection on Net-A-Porter, including a video of the shoot. This entry was posted in celebrity, Magazines and tagged collaboration, designer, erin wasson, International designers, low luv, Magazines, models, Net-A-Porter, Photography, Styling, zadig & voltaire by houseofturtle. Bookmark the permalink.